Originally, I had the notion of a traditional cottage garden for my patch, with flowers, fruits and vegetables all mingling happily with each other. I tried it, I didn't like it...it just didn't work. I was either treading on a dainty flower in my effort to dig up a heap of potatoes, or stabbing my eye on a cane trying to reach over plants to grab a runner bean. I ended up resenting the vegetables for taking up so much space. But, there really is nothing like raising your own food to eat, so a few years ago, I decided to start growing in pots on my patio. To my surprise, it was a huge success, and it's now something I do every year and really look forward to. 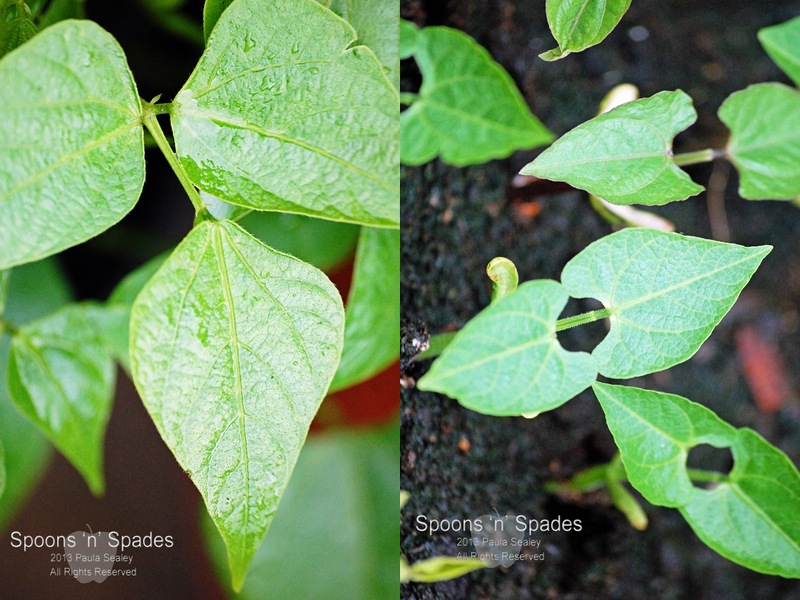 I've found that there really is nothing you can not grow in a pot, and it's a huge advantage to be able to hop out of the kitchen onto my patio and cut a few leaves for a salad, or pick some beans to accompany dinner. 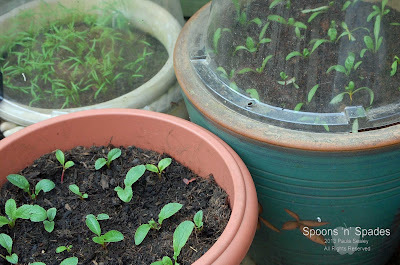 There's no secret to container growing either, I use basic potting compost in the pots, sprinkle on some seeds or pot on a pre-grown plant and wait for them to grow. 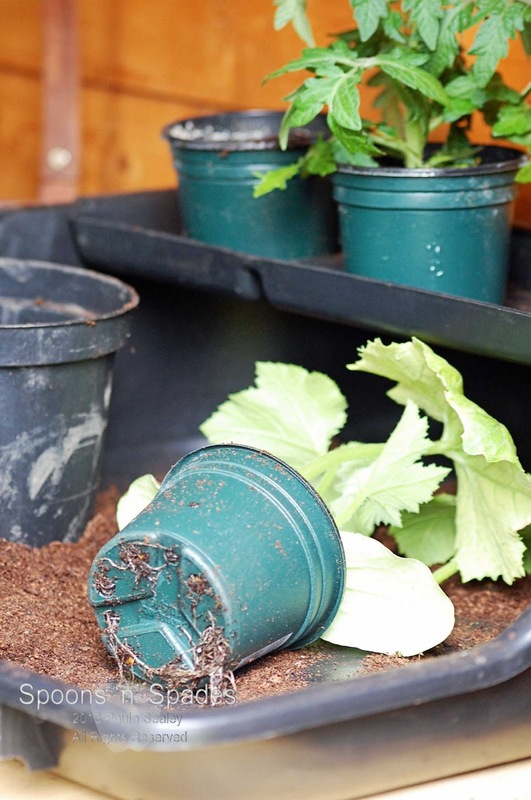 A couple of things I have discovered though, is the importance of the container you plant in. 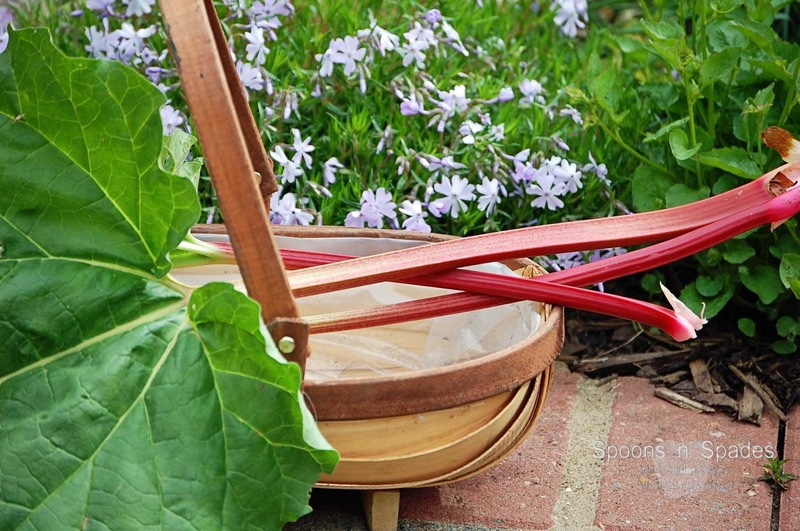 You have to use a pot large enough to accommodate the fruit or vegetable, and then some. There's really no point growing in a tiny pot or one that's just about big enough, as the roots of the plant become stunted and you end up watering all the time! Trial and error means I have a preference for plastic pots too. Terracotta looks lovely, but it dries out the soil so quickly and the pots are always breaking in frosty weather, even those that claim they won't! I do feed my pots as well, usually once a fortnight, with a general purpose tomato fertiliser. Several of the vegetables that I'd grown from seed were ready for their second potting on. I usually wait until I see a few roots poking from the bottom of the pot before I do this, these had more than a few, proving the actual garden has had me very occupied over the last couple of weeks. 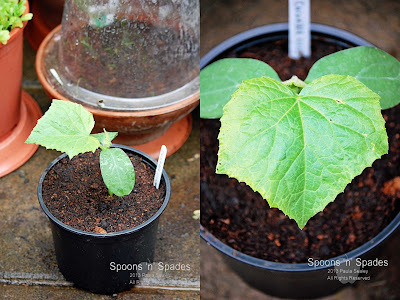 Cucumbers are coming along nicely, and when they get potted on the next time, they'll be transferred to the sunnier side of my patio, with some trellis fixed behind the pot for them to scramble on. Tomatoes will also join the sunny side in a week or two. Because there will be some sun...won't there? 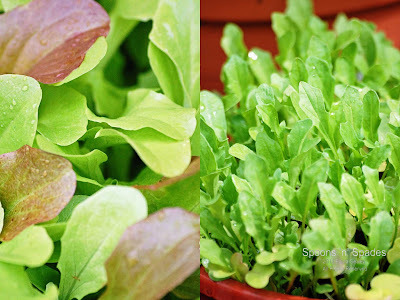 Lettuce, Mixed Salad and Rocket will stay on the shady side, as it's cooler and helps prevent them from running to seed. They are romping away at the moment, and I've been thinning out the seedlings, as well as sowing new batches so there will always be some ready to eat throughout summer. I also succession sow French Beans and Radishes, both vegetables I adore and can eat by the bucket load! I'll be adding a third set of pots next week for these. The first set should be ready in a couple of weeks. 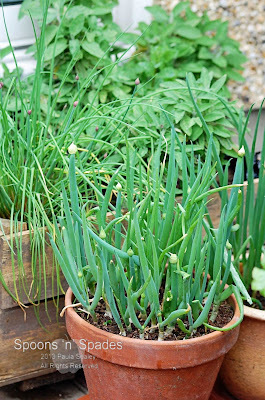 Spring Onions are 'springing' along. I usually leave one pot to flower, so I can enjoy the little petals scattered over salads, and the others get snipped on a regular basis. The wooden box at the back has Sage, Thyme and Chives in. I picked the first few stalks of Rhubarb today, ready to be roasted tomorrow morning and served with some natural yoghurt and a drizzle of honey for breakfast. The Strawberries in the raised beds on the patio have started to flower, and I've started to drool over the thought of freshly picked fruit for my pudding! I snaffled this Blackberry runner from my Mums garden the last time I was digging there. I don't really need blackberries in the garden as the nature reserves where I live are full of them in summer, but this is a thornless variety, so I thought it might save my poor arms from being scratched to pieces, and provide enough fruit to add to the breakfast bowl every now and then. Of course, there are still one or two edible things in the actual garden. 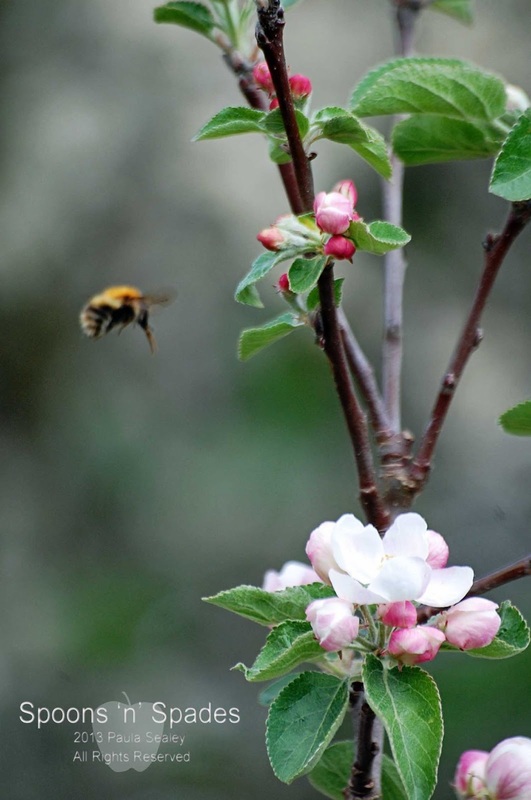 The Apple Tree for one. And the raspberries, that have a patch of their own in the far right corner. I'm happy to leave them there and just dig up the runners when they get out of hand. They produced an enormous amount of fruit last year! I'm hoping for a good bounty this year! I spied a plant that we have on flower at the moment peeking out from behind the rhubarb on a chair a phlox. Oh yes, the Phlox is in full bloom along the edge of one of the wildlife ponds. 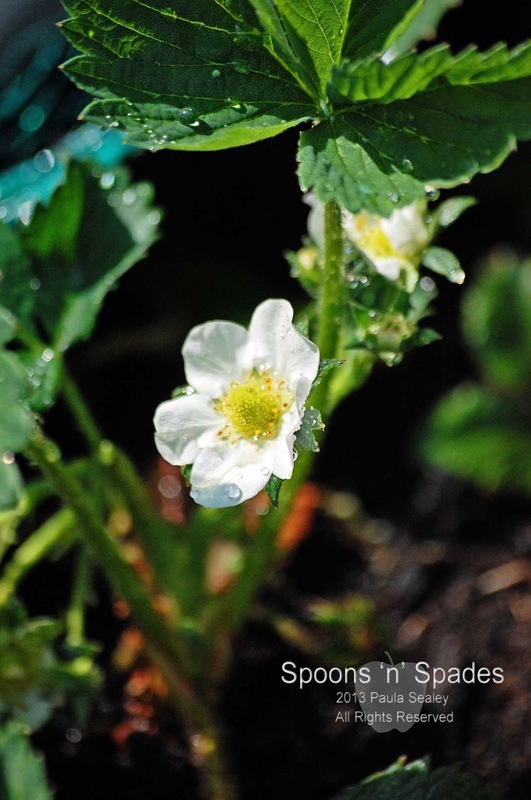 I'm looking forward to dividing it this year and spreading it around the garden. I'm impressed, that is a fantastic selection of veggies that you have on your patio, you put me to shame, I really must try harder! My garlic chives have decided to seed into the cracks in the paving, they were under water I don't know how many times last year, for days at a time, but they have come up like cress, we will have loads! Luckily, no rabbits here, Wendy, just the pesky squirrels and my cats digging up every bare patch of earth! 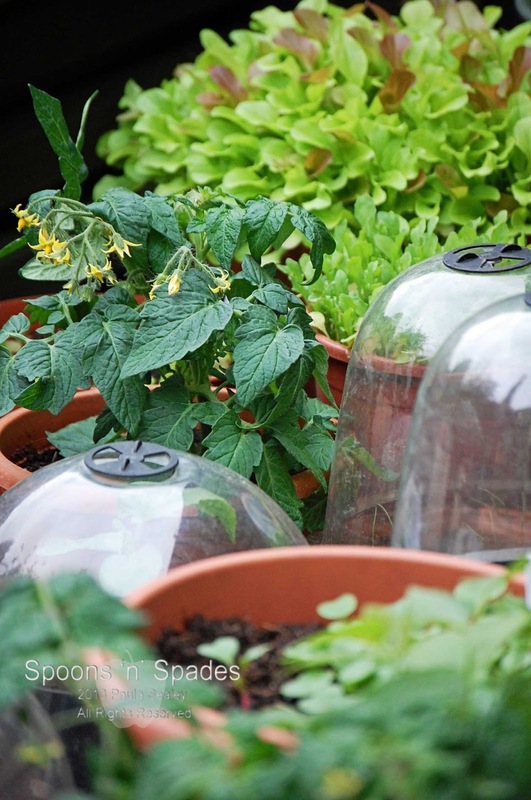 I find the cloches invaluable for covering the pots while the plants are young. Everything looks very healthy and abundant. 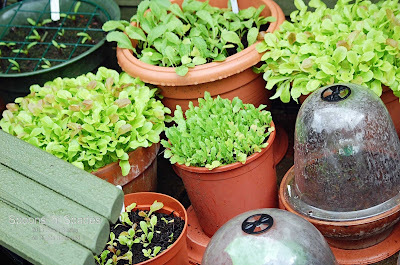 I haven't planted anything tender out yet - it is far too cold where we are - I think container gardens are great, especially when you are short of space. Now all we want is a bit of summer weather for everything to thrive. 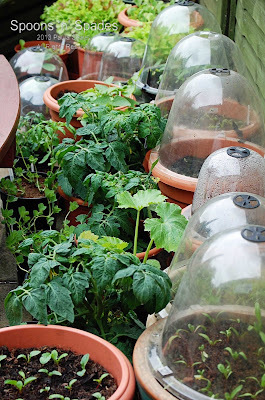 I was a bit worried about the weather, Elaine, as it's certainly turned a bit chilly now, but I have the fleece handy to cover everything if a frost is forecast, and most pots still have their cloche protection. Let's hope the sun puts in an appearance again soon. Goodness me, what a huge variety of veg and fruit you are growing. And all in pots too....fantastic! I find the clay pots always break too and use the plastic ones now. At least it's not just me with the pots then, it's a shame, but too much of an expense to have to keep replacing them. Good for you growing all that in containers, and it all looks great as well. 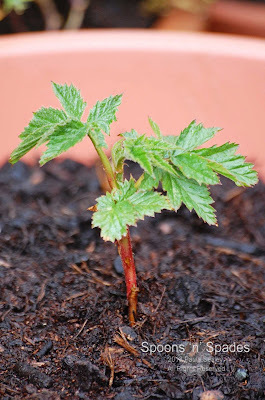 Oh my word, are you really growing raspberries in a container?? 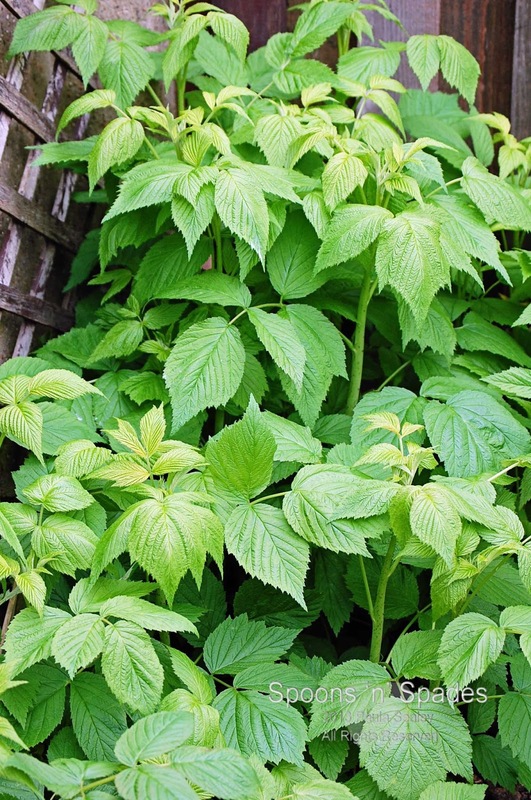 I so want raspberries but have nowhere to plant it, what variety do you grow, how big does it get, and what size container do you use? 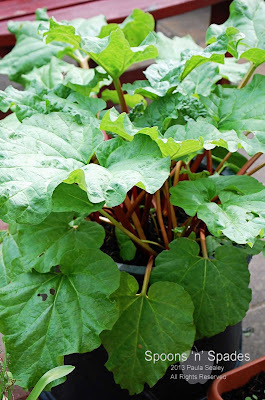 I can't believe you grow rhubarb in a container either, I used to grow them in Norway, they were huge plants 1.5 m tall and almost as wide. Are there smaller varieties or do you have just a young plant? I am hooked on vegetables in containers myself too, it's my first year doing it, but on a much more modest scale than you. I have beetroot, radish, mixed lettuce, chives and thyme so far. My lettuce is almost ready for the first snip! Aah no, the raspberries are in the garden, Helene, left over from when I used to mix and match fruit, veg and flowers. I don't see any reason why you couldn't grow them in large pots though, I'm sure they'd be just as successful and I may even start to do that with some of the runners, as they do begin to take over otherwise. I've been trying to limit the number of containers I have in my garden - but to no avail! There are just so many things I want to grow that I have to make maximum use of space. Your veg containers look absolutely "bountiful", so you have evidently become expert at the art! What types of tomato have you got? I have Totem, Sweet 'n' Neat, Tigerella, Tumbler, Gardener's Delight and Fantasio, Mark. I would have had Marmande as well, but one of my cats knocked my tray of seedlings over early on (insert grumpy face here!). WOW Paula...your veges look wonderful!! I was getting hungry just looking at the pictures! There really isn't anything like home grown veges. You did make me chuckle when I read the first paragraph about trying to grow flowers and veges together and getting stabbed in the eye or stepping on the flowers! Really enjoyed this post. Thanks, Christy. I agree, home grown is so much nicer. You have a fantastic variety of vegetables in pots! I really like this idea. My own veggie plot is not large enough to accommodate all the things I would like to grow. Maybe it is time to expand into pots on the patio!